I’ve eaten so much seafood in the past few weeks, but can’t complain…it was sooo good. Come to think of it, I used to eat much more red meat than seafood, but it’s the opposite now. I love how seafood dishes can be light and satisfying, unless it’s a bowl of steaming hot chowder served in a sourdough bowl at Pier 39 in San Francisco, or a big scoop of fish pie topped with crusty Parmesan potato! Then you’ve got there both satisfying and something to doze off afterwards. My recent trip to Alaska showed me how simple fish can be – especially salmon. I’ll blog about that trip soon. In the meantime, I made these great salmon fish cakes with only two main ingredients – salmon and potato. The rest of the flavor comes from fresh herbs, which you can switch up to whatever you have in your garden at this time of the year. I seriously doubt these salmon cakes could be spoiled by any formula of herbs, I say, the more the better! Salmon is such an easy fish to cook. Bake, broil, grill, steam, wrap it in pastry, or even eat it raw. The choices are endless, and so are the types of salmon. Now is a good time to find Coho and Sockeye, which are in season from July through December, and I’ve noticed that the prices have become more friendly than they were a couple of months ago. King Salmon (Chinook) are preferred by many as the best, but the other four – Sockeye, Pink, Coho and Chum – are all just as good in their own unique ways. Copper River Salmon can be either King, Sockeye or Coho, and is usually more expensive than the others. After spending time in Alaska, I can see why. The state and its waters are pristine, free from pollution and full of fat, healthy fish. Atlantic commercial salmon are usually farmed, and that’s a whole other story for another day. Salmon doesn’t need much to make it tasty – simple seasoning and fresh herbs, or a dab of sauce, and it’s ready. It also cooks fast and will keep cooking after you take it away from its heat source. Don’t overcook it; I like to give it a gentle poke with my finger, and if it feels firm, then it’s probably overdone. Try for a spongy feel to it and then let it rest for five minutes. 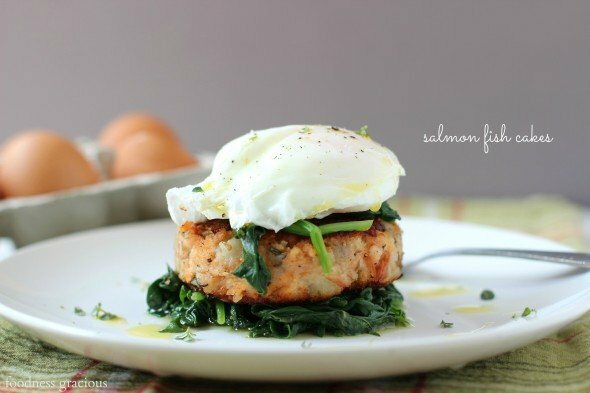 These salmon cakes would be great for brunch or even dinner, and with the soft poached egg on top, I know my kids will lick the plate clean. Yummy salmon fish cakes make for an easy dinner or appetizer! Cook the potatoes in a pot of boiling water until tender, drain and cool. Chop the salmon into small pieces. Once the potatoes are cool, put them in a large bowl and mash them with the back of a fork. Add the chopped salmon, fresh herbs, salt and pepper and mix well. Using the flour to rub on your hands, divide the mixture into four ounce balls. Form each ball into a patty shape and gently flatten. Transfer to a baking tray and refrigerate for one hour. Heat the oil in a non-stick pan or skillet until hot. Cook the fish cakes 4-5 minutes each side and they become nice and golden. Put the spinach in a pan with a drop of water and cook until wilted, about 2-3 minutes. Set aside. Poach the eggs in a pot of simmering water with the vinegar for 3-4 minutes and still remain soft. Place a spoonful of spinach on each plate and top with a hot fish cake. Finally lay an egg on top of the fish cake and season with a little salt and pepper. Drizzle some of the olive oil around each fish cake and garnish with more fresh herbs if desired. So pretty and so awesome! I love everything about these cakes. EVERYTHING! Oh and your poached egg look perfect! This looks wholesome, Gerry. 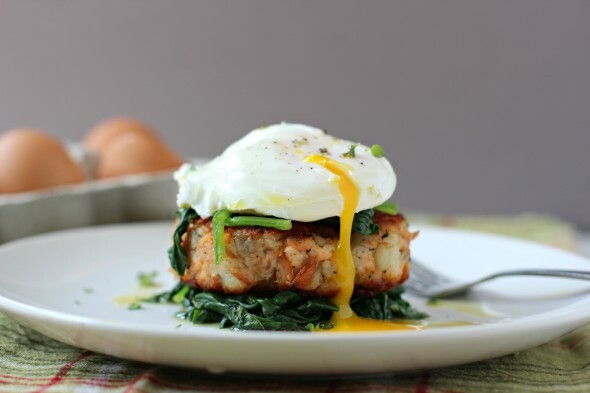 Salmon cake and that poached egg…o my..that’s a divine combo. It was amazing Greg as you already know, such a beautiful place! Gorgeous!! This would be a hit for brunch in our household! Gerry this would be my husband’s DREAM FOOD! He loves salmon AND eggs. Seriously, it’s his perfect meal. I need to make this! Make the poor man some salmon! Des, such a great area for seafood! These are so gorgeous and fancy! I love a poached egg! Wow! Gerry, this looks AMAZING! Thanks Valentina, hope you’re doing well! Awesome flavors, Gerry! I love salmon, love love love it! And the poached egg on top…perfection! I bet that Alaska was beautiful, can’t wait to hear about it in the post. This is a gorgeous dish, it’s a shame I don’t care for fish. It was truly pristine Chris, I couldn’t believe it.. 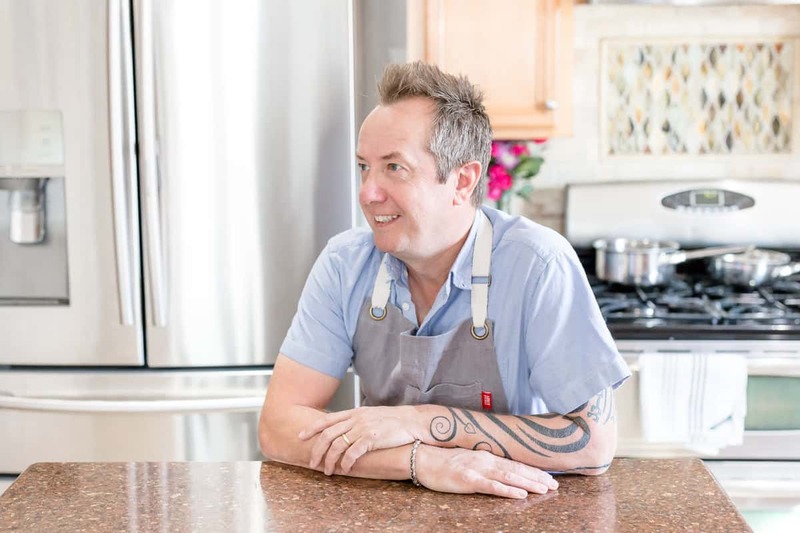 I absolutely love salmon – it is definitely my favorite food from the sea. Thanks for the mini lesson! These look delicious! You’re welcome Melanie, thanks for the visit! This is like my dream breakfast! Gorgeous, G! This has everything the husband LOVES to eat (well, minus the spinach — but I love that part so it stays! :)). Pinning to make very soon! 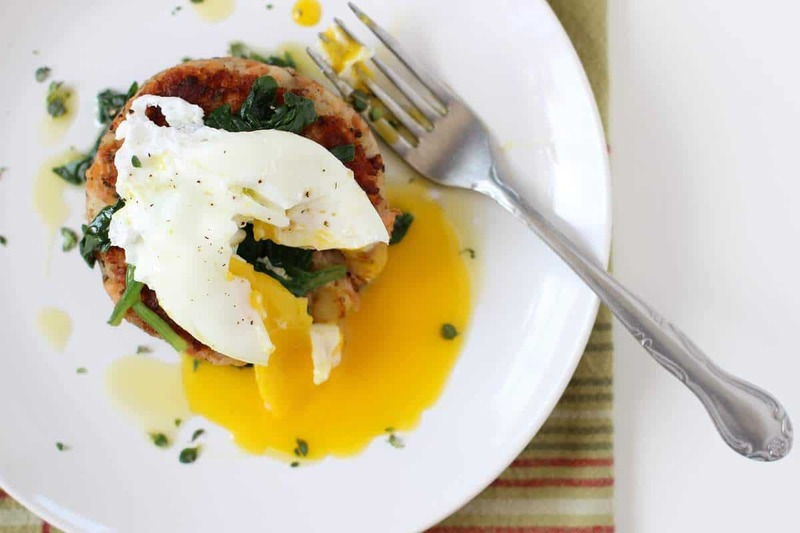 What’s your trick for the perfect poached egg? Mine just never work quite right…. Wow, that is one seriously pretty dish, and we love that it can be eaten for any meal of the day. Flexible AND delicious! We’re going to link to this recipe from our Facebook page so our fans can see how to make it, too. 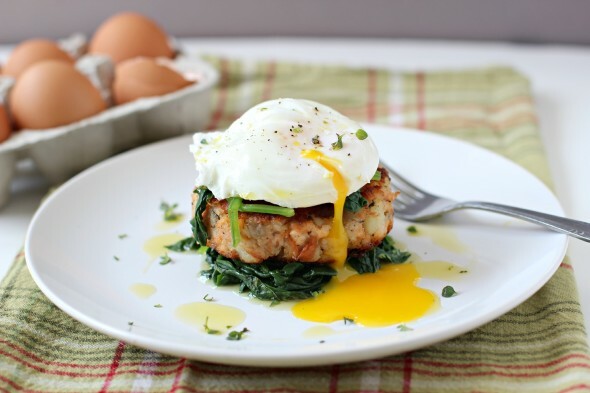 Love these salmon cakes…especially with that beautiful egg on top on. The yolk must make the most delicious sauce over the fish. I’m with you…seafood is so satisfying and light. Pinning right now! These look absolutely to die for. 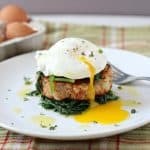 I’m writing a very novice post about learning to poach an egg, and wondered if I could use one of these pictures as my food “goals.” I would credit this post, just wanted to see if that would be alright before I went ahead and did it! Hi Kailyn, thanks! Feel free to link up to my post with a picture.